LING-JU LAI, a native of Taiwan, has garnered consistently favorable reviews of her creative interpretation of Baroque keyboard music, particularly the music of J.S. Bach. Sir András Schiff expresses of her, “Ms. Lai has a questing musical mind. Her approach is unusual and valuable….a very gifted musician and pianist.” The Baltimore Sun writes, “The depth of the sound sinks in with startling poignancy as Ling-Ju Lai lets the notes linger long in the air…a moment of musical insight to savor.” As a concert pianist, Ms. Lai has performed as a soloist in leading international venues and participated in acclaimed music festivals, such as the Royal Academy of Music in London, Gewandhaus in Leipzig, Town Hall in Bruges, The National Theater in Taiwan, The Bach Festival in Leipzig and The William Kapell International Piano Competition in Maryland. She was named the “Rising Star” by two of Taiwan’s most prestigious performance organizations: The National Taiwan Concert Hall and The National Taiwan Symphony Orchestra. As a historical keyboardist, Ms. Lai appeared as the Artist in Residence at Utah Valley University with recital and concerto engagements. The UVU Newsroom writes, “The opportunity to hear a solo harpsichord recital with an artist of Ling-Ju Lai’s caliber is extremely rare. Often even musicians are not aware of the expressive power that the instrument has in the hands of the right performer. Ling-Ju Lai’s playing will transform the way you hear the harpsichord.” Ms. Lai is best known for her emotive and incisive performance of The Six Partitas by J. S. Bach, presenting All-Bach programs in New York, Boston, Chicago, St. Paul, Minneapolis, University of Michigan, Susquehanna University, Ateneo de Madrid and the International Cultural Program of the Menendez Pelayo University in Santander, Spain. Ms. Lai recently appeared as the featured soloist, with the Bachiana Filarmônica Orchestra in São Paulo, Brazil, performing J.S. Bach’s D Minor Piano Concerto, collaborating with celebrated Bach interpreter and conductor, Mr. João Carlos Martins. Featured at the 2015 Dame Myra Hess Memorial Concert Series in Chicago with live broadcast on WFMT 98.7 fm, Ms. Lai also performed, for two consecutive years, at the inaugural concert of the Primera Fila Series at Royal Magdalena Palace in Santander, Spain. Highlights of the 2016-17 season include appearances in notable concert series such as the Aula de Música at the University of Alcalá in Spain, the PianoForte Foundation Salon Series in Chicago, Steinway Gallery in Boca Raton, Utah Valley University, and Brookline Library Music Association Concert Series in Massachusetts presenting The Goldberg Variations by J. S. Bach. 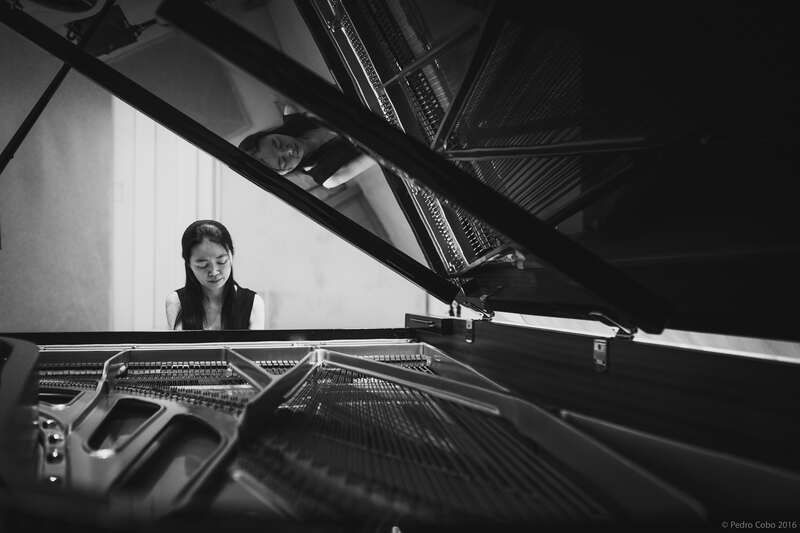 Ms. Lai received graduate degrees in Piano and Harpsichord Performance from the University of Michigan and Eastman School of Music, where she was awarded the Performer’s Certificate for her excellence in performance. LING -JU LAI ha obtenido críticas favorables de manera consistente sobre su creatividad interpretativa de la música barroca; en particular la música de Johann Sebastian Bach. The Baltimore Sun escribió: “La profundidad con que el sonido se asienta produce una intensidad sorprendente, al permitir Ling-Ju Lai que las notas permanezcan por mucho tiempo en el aire … un momento de inspiración musical para saborear.” Como concertista de piano, Ling-Ju Lai ha actuado como solista principal en importantes foros internacionales y ha participado en festivales de música de renombre, como la Royal Academy of Music de Londres, Gewandhaus de Leipzig, Stadhuis de Brujas, el Teatro Nacional de Taiwan, el Festival de Bach en Leipzig y la William Kapell Internacional Piano Competition en Maryland. Ha sido nombrada “Estrella Emergente (Rising Star)” por dos de las organizaciones más prestigiosas de Taiwan: The National Taiwan Concert Hall y la Orquesta Sinfónica Nacional de Taiwán. Como pianista histórico, Ling-Ju Lai apareció como artista invitada de honor por la Universidad de Utah incluyendo recitales solistas y conciertos asi como lecciones magistrales: La UVU Newsroom escribió: “La oportunidad de escuchar un recital de clavecín con una artista del calibre de Ling-Ju Lai es extremadamente raro. A menudo, incluso los músicos no son conscientes de la fuerza expresiva de este instrumento cuando esta en las manos del artista apropiado. La manera de interpretación de Ling-Ju Lai transformará su forma de escuchar el clave.” En la temporada 2013-14, Ling-Ju Lai ha participado como solista principal en recitales incluyendo Las Seis Partitas de Bach en Nueva York EEUU así como en Madrid, España. Además, abrió la temporada de conciertos de la Orquesta Bachiana Filarmónica en São Paulo interpretando el concierto en Re menor para piano y orquesta de J.S. Bach bajo la dirección del celebrado intérprete de Bach y Director, Mr. João Carlos Martins. Ling-Ju Lai recibió títulos de postgrado en Piano y Clave por la Universidad de Michigan y la Eastman School of Music, donde obtuvo el Certificado de Excelencia. LING-JU LAI überzeugt Kritiker beständig für ihre kreative Interpretation barocker Tastenmusik, insbesondere der Musik J.S. Bachs. Die Baltimore Sun schreibt, “Die Fülle des Klangs wirkt mit verblüffender Eindringlichkeit, wenn Ling-Ju Lai die Noten lang nachklingen lässt … ein genussvoller Moment musikalischen Tiefblicks.” Als Konzertpianistin tritt Frau Lai als Solistin in führenden internationalen Konzerthäusern und berühmten Festivals auf, wie der Royal Academy of Music in London, dem Gewandhaus in Leipzig, dem Brügger Rathaus, dem National Theater in Taiwan, dem Leipziger Bach Festival und dem internationalen William Kapell Klavierwettbewerd in Maryland. Sie wurde von den zwei angesehensten Musik Institutionen Taiwans als “Rising Star” gelobt: der National Taiwan Concert Hall und dem National Taiwan Symphony Orchestra. Als Interpretin für Alte Musik trat Frau Lai im Rahmen des “Artist in Residence” Programms an der Utah Valley Universität zu Klavierabenden und Konzerten auf. Die UVU Newsroom schreibt: “Die Gelegenheit, einem Cembalo-Solo-Konzert eines Künstlers von Frau Lai’s Kaliber beizuwohnen, ist extrem selten. Oft sind sich nicht einmal Musiker der Ausdruckskraft dieses Instrumentes in den Händen des richtigen Interpreten bewusst. Ling-Ju Lai’s Spiel wird Ihre Wahrnehmung des Cembalos verändern.” In der Saison 2013-2014 hat sich Frau Lai auf Solo-Klavier-Werken J.S. Bachs konzertiert, darunter anderem die Sechs Partiten in New York, USA und in Madrid, Spanien. Ebenfalls trat Sie ist als Konzert-Solistin mit dem Bachiana Filarmônica Orchester in Sala São Paulo, Brasilien, unter der Leitung des gefeierten Bach-Interpreten und Dirigenten João Carlos Martins auf. Frau Lai erlangte den Magistergrad in Klavier und Cembalo an der University of Michigan und der Eastman School of Music, wo ihr das Performer’s Certificate für aussergewöhnliche Konzertdarbietung verliehen wurde.